As a young Christian I heard the truth that God’s ways are not my ways and His thoughts are not my thoughts. I remember being told that I was not to lean on my own understanding if I was to discover God’s direction for my life. While those truths are from scripture, it tended to make me feel that the only sure way to know God’s will for my life was to look at my own will and then cross that off my list completely! I started to picture God as using my desires as a corrective tool. I jokingly saw a young person aspiring to enter a particular profession (for me it was law enforcement) and seeing God in heaven saying “Well, I see you want to be a policeman, so I decided you should be a garbage collector!” Satan always loves to take God’s Word and incorrectly interpret or apply it so as to pervert who God is. Isn’t that precisely what he did in the garden? The truth of the matter is the Bible teaches quite a bit more on this subject that is quite encouraging. For instance, listen to Psalm 20:4-5 “May He grant you your heart’s desire, and fulfill all your counsel! We will sing for joy over your victory, and in the name of our God we will set up our banners. May the Lord fulfill all your petitions.” Did you get that first and Last phrase? If all of your desires and prayers were merely evidences of what God doesn’t want for your life these words would make no sense at all! First there is Joseph. God gave Joseph dreams of being a great ruler before whom everything and everyone would bow down (including his family!). We later discover God would fulfill these dreams literally, many years later. Then, there is David. He was anointed to be king as a young boy.That was a thought, an idea, an aspiration that God created in David, not David independent from God. As a young man in seminary I wanted to go into ministry with a man God had particularly used in my life personally. He had been the youth pastor at my church. However, he had left that church and moved hundreds of miles away to pastor his own church. I really felt the Lord had put this on my heart and so I approached him to see if he would be open to leaving his church and join me in church planting around the country. He was open but the Lord never brought it to pass. I was disappointed. Years later, after God called me to plant a church in Southern California, my pastor friend was led to become a missionary in Ethipoia. That’s the other side of the world I thought! However, he needed financial support and our little fellowship was able to help him and his wife serve there for ten years. When his health prevented him from staying on the field, he returned to the U.S. and guess what happened? He came on staff at our church! We have pastored together now for over eight years! God has amazing ways of planting desires that he intends to fulfill in his time! If you love the Lord and have deep desires, especially to be used by Him, then trust that you will discover in time that He has been at work all along! Alice meets The Cheshire Cat in a tree. It constantly grins and can disappear and reappear whenever it likes. Sometimes it disappears and leaves its grin behind. On one occasion, Alice is perplexed as she approaches a fork in the road. “Would you tell me, please, which way I ought to go from here?” she says. “That depends a good deal on where you want to get to” says the Cat. “I don’t much care, where” says Alice. “Then it doesn’t matter much which way you go” says the Cat. How important it is for us as believers to discern the purposes and the direction of God for our lives. Sometimes, it feels as if we are sailing the seas of life, blown by winds, drawn by currents wherever time and chance direct our sail-less dingy to go. However, we must remember God’s wonderful promise in Psalm 32. So according to God’s Word “There is a way you should go”. That means there are plenty of other ways you should NOT go! Most of us have learned there are many different ways to fall off a cliff, but only one road that is leads to the other side of the mountain. 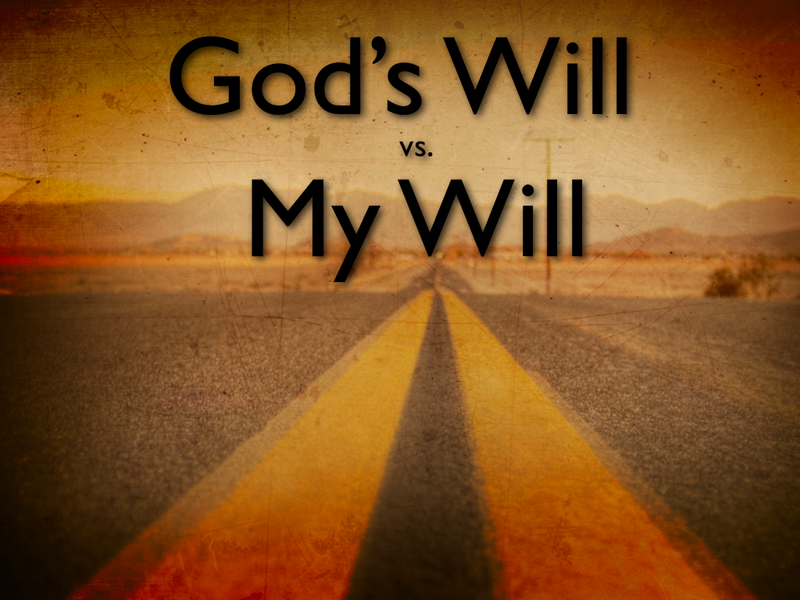 How do I discern the will of God? How do I know which way to go? Much could be said. Much more has been written. But perhaps we can simplify it. Often our tendency is to consult only the outward circumstances or merely our own desires and perhaps even block out unwanted counsel from godly friends. Remember God wants to direct you but you do need to step out in faith trusting He will steer you as you “step” out to do His will. You cannot steer a parked car and God won’t often steer a “parked Christian”. As Paul the apostle set out on the first missionary journey he began to get direction of where he wasn’t suppose to go (as he attempted to go there). Then, as he got to the road’s end and no doubt was seeking the Lord, God gives him further direction. The saying here is helpful “Do what you know and you will know what to do”. Remember, following the Lord is like walking with a lantern. You can see only a few feet ahead of you when you are carrying a lantern. However, as you take a step, you discover now you can see farther than you could before you took the step! That’s how it is with God’s direction: Step By Step! Remember even someone as godly as Joshua was misled because he leaned on his own understanding rather asking the Lord for direction. This illustration shows how to line up five crucial factors that will help a person seek and understand the will of God. Each light represents a factor and the safety of the harbor represents God’s will. 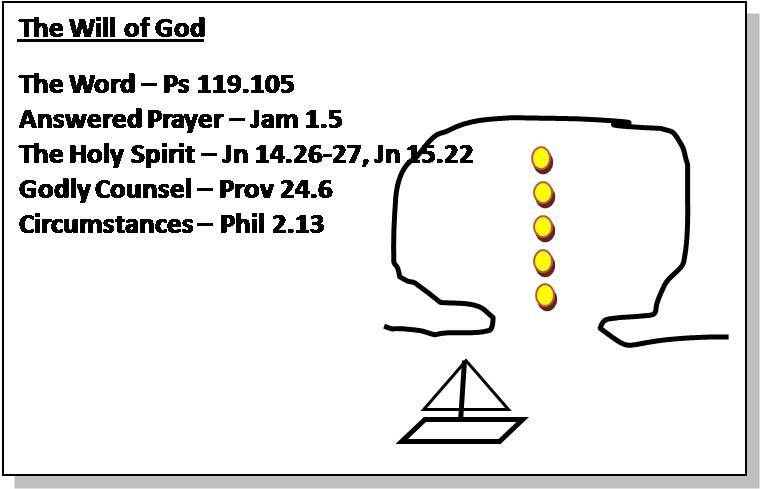 As we line up the lights (factors) we can sail safely into the harbor (God’s Will).